2018 Formula E Review - "When In Rome"
Two years ago I’ve received an invite to my first ever Formula E race. The event was taking place in Berlin, Germany and BMW was still pondering with the idea of eventually joining this new type of racing championship. 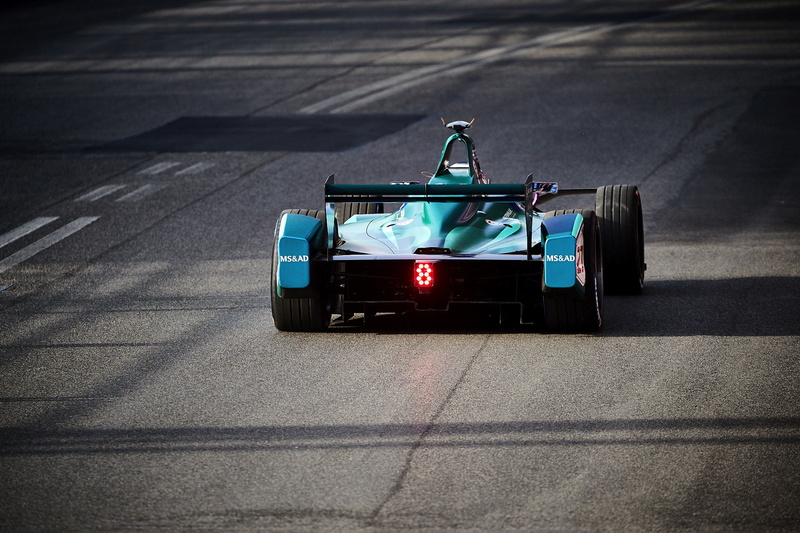 Less than two months later, in July 2016, BMW Motorsport Director Jens Marquardt has confirmed that BMW is working alongside an existing Formula E team, with a view to a full entry in the future. 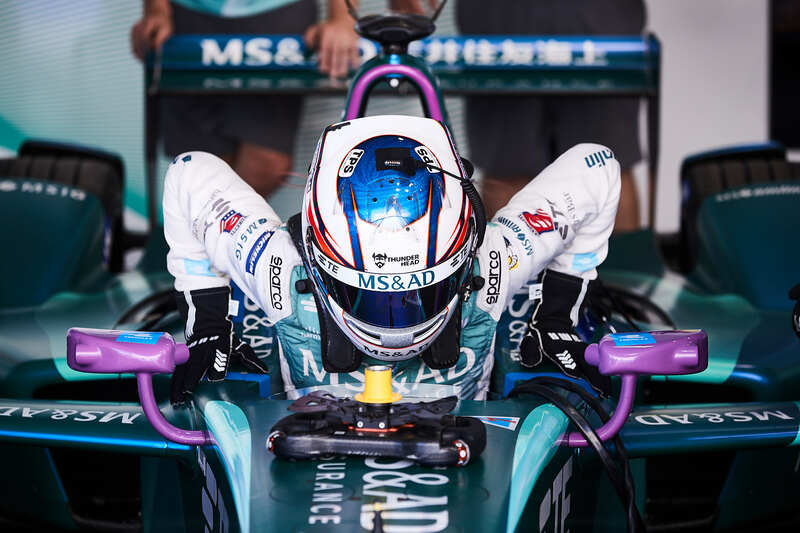 The team’s name was kept out of the conversation, but shortly after, confirmation came in – the MS&AD Andretti Formula E team was going to be BMW’s partner in this new racing venture. As cooperation partner of Andretti Formula E, BMW Motorsport was going to work closely with the team, “in order to familiarize itself with processes in this innovative series, and to check the possibility of a works involvement in the future,”, the automaker said in an official statement. 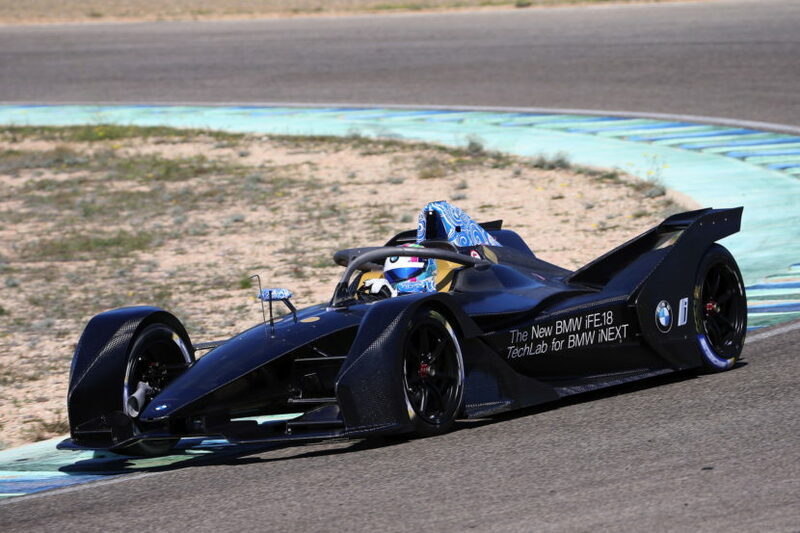 BMW was offering its electro-mobility expertise gained through its i-Division, while MS&AD Andretti the electric racing know-how. The Formula E partnership with the American team was also opening doors for a further collaboration with FIA and its futuristic championship. 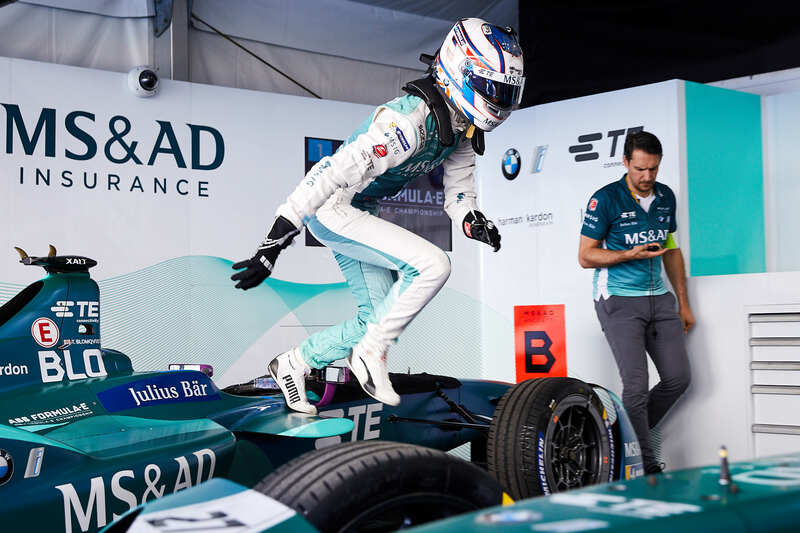 At the time, Marquardt re-iterated BMW’s deep-rooted stance of waiting for Formula E to mature to one-car-per-driver series, which is projected to happen in season five of the series. Now Season 5 is less than a year away and many things have changed since 2016. While BMW continues to be involved in this Formula E season as the “Official Vehicle Partner” through its two BMW i8 Safety Cars and several i3 Medical Cars, the big news of the last few months was the Bavarians’ decision to officially enter Formula E in the 2018-2019 as a factory racing team. 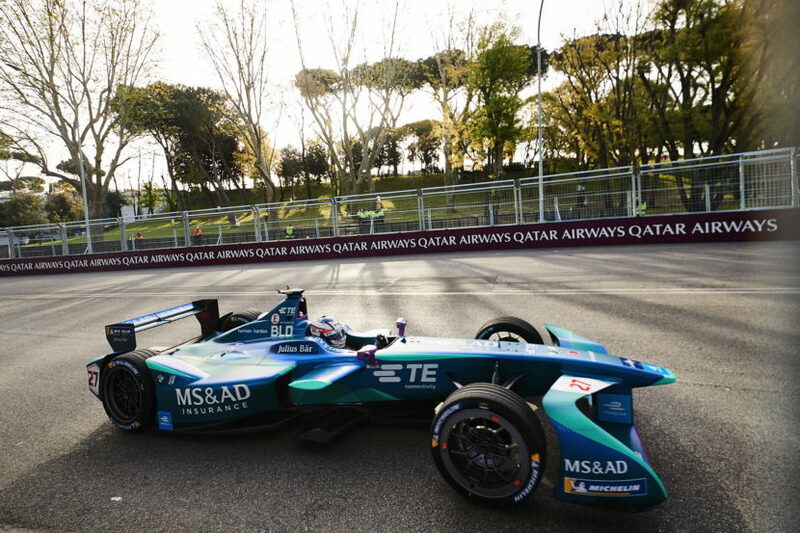 The cars, equipped with a completely newly-developed BMW drivetrain, will be run by the Andretti Formula E team and BMW as BMW’s works entry in the series, and will compete with the likes of Audi, Mercedes, Porsche and Jaguar, just to name some of the major automakers who are now ready to battle each other in the electric vehicles field. 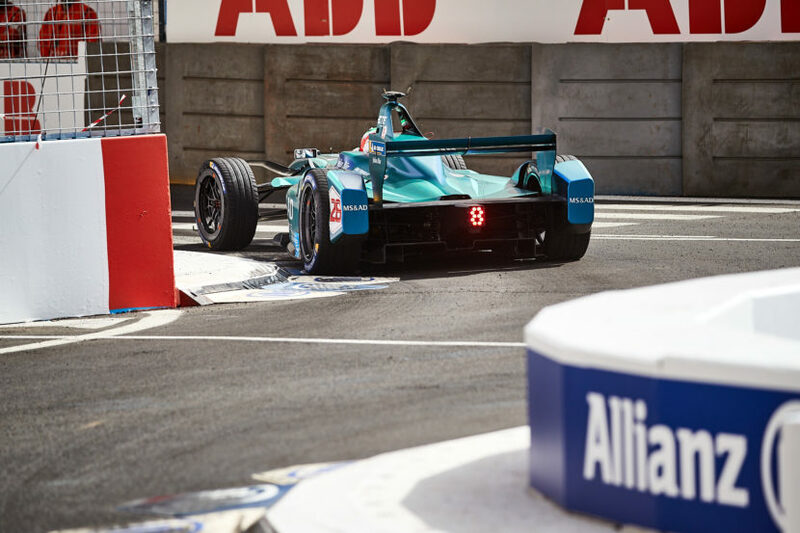 In order to observe the progress of the FIA Formula E Championship, BMW Motorsport has extended an invite to join them in Rome for the first ever ePrix, held on the historic grounds of the Roman citadel. 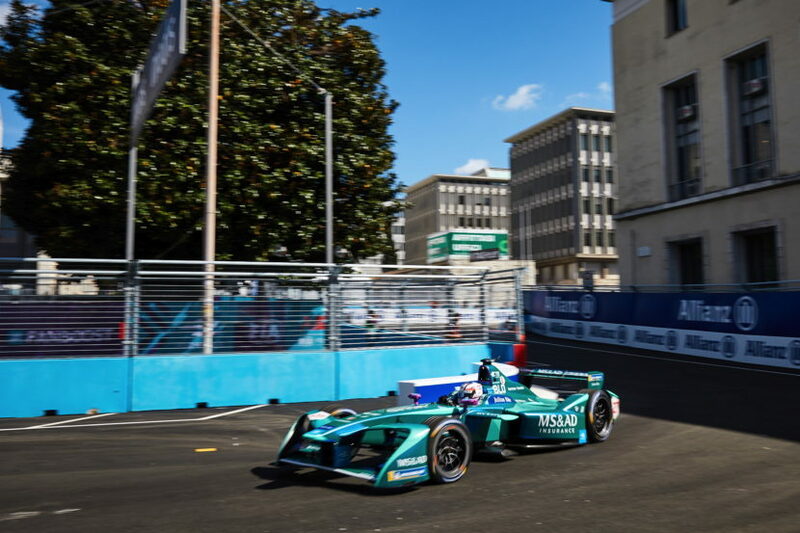 The Formula E races are held almost exclusively on city centered street courses, the only exceptions being the Mexico City ePrix, being held on the Autódromo Hermanos Rodríguez instead of the usual street course, and Marrakesh. So in Rome, FIA chose the grid on the tree-lined Via Cristoforo Columbo, the speed around the towering Obelisco di Marconi and sweep past the iconic Colosseo Quadrato. If that doesn’t sound exciting, then nothing else will. Furthermore, the Rome ePrix is the second longest track of the season, at 2.84km, which guarantees more fun than most races. 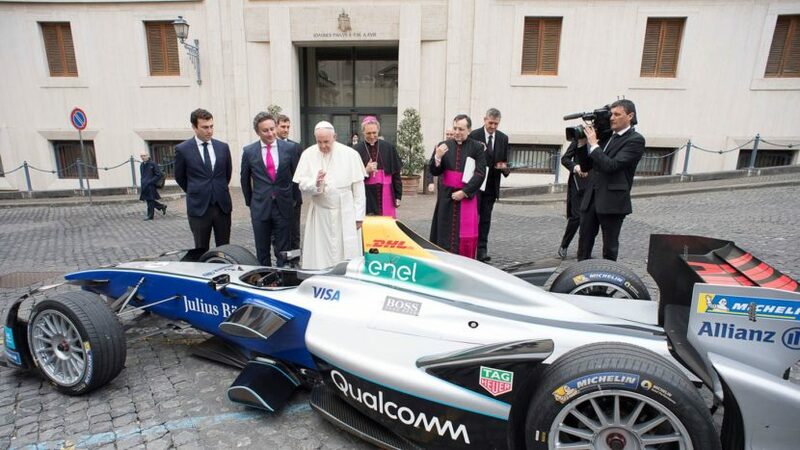 But since Rome goes hand-in-hand with Vatican City, Pope Francis took a look at this year’s Formula E car, and His Holiness even blessed the all-electric racer. The Pope also met with Formula E creator and CEO, Alejandro Agag, and some of the drivers, in the days leading to the championship race. 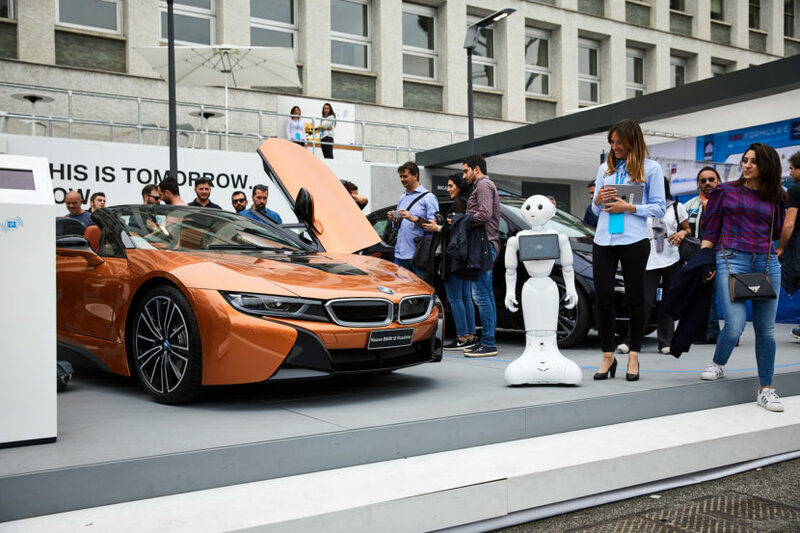 My journey in Italy actually began just a few days earlier, with a short trip to Milan where I also had the opportunity to sample some BMW i3s as part of the DriveNow car-sharing program that BMW runs in Europe. Being accustomed to my own i3 electric vehicle, I found it refreshing to see how the first BMW electric car lives in the busy and narrow-built streets of Milan, where the likes of Fiat 500s and 1 Series Hatchbacks are the norm. 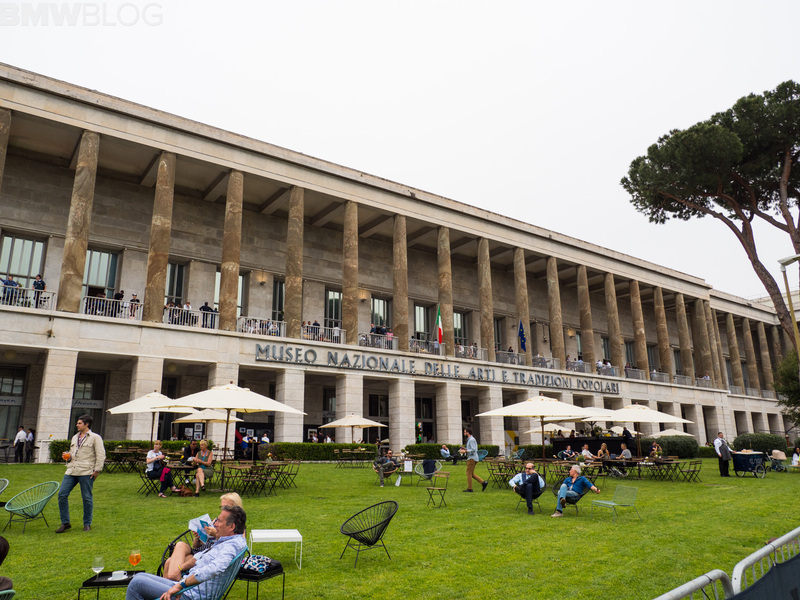 A few days later, I found myself on a high-speed train heading to the beautiful Roman city where the energy around the first Formula E race was immediately noticeable in the Roma Termini station, where lots of promotional materials and billboards were promoting the electrified championship. It’s now Friday morning and a quick taxi trip to the Piazzale Delle Nazioni Unite brings me up to the FIA Credentials Office. Of course in the typical Italian national sport – read: complaining – my driver argues his way into the closed streets surrounding the track, not before expressing his dislikes of the situations, despite the higher taxi fare to get around. Now in possession of the precious press credential, which often is another adventure in itself, I am ready for the first event of the weekend – the drivers press conference. As soon as I arrive on the premises of the grandiose Piazzale Delle Nazioni Unite and its Roman architecture, one thing stands out immediately – the ePrix has gotten bigger, with more security around the circuit, more bridges to connect the different venues and interesting enough, a large number of journalists. At my first ePrix in Berlin, in 2016, the media room was setup outside in a closed-off tent, with tables and chairs likely sitting no more than 30 people, in contrast to the large room inside this Roman palace filled with hundreds of journalists and photo reporters genuinely interested in the the press conference and the drivers. The importance of the event was even more significant when the Mayor of Rome Virginia Elena Raggi and the famous Jean Todt, President of the Fédération Internationale de l’Automobile (FIA), were also present to express their thoughts on the first Italian ePrix. Like any other major racing championship in the world, the access granted to the media is somewhat liberating. It is often difficult to get interviews with the drivers, but just outside the media center, in a small corner, some drivers were available for ad-hoc interviews, which makes for an interesting dynamic. As the day went on, I had the chance to walk the pitlane where the teams were putting the final touches on their racing cars. It’s always interesting to observe from upclose the preparations that take place leading to the race, considering the type of racing cars one has to deal with. Drivers use this session to check the electronic systems and the reliability of the car, but not overall performance as the cars run at a reduced speed. While at the MS&AD Andretti box I was allowed to observe from upclose the car change process featuring BMW Motorsport factory drivers Tom Blomqvist and Antonio Felix da Costa. For the upcoming 2018-2019 championship, the mandatory pit stop might go away, but that hasn’t been set in stone yet. BMW Motorsport Jens Marquardt has told us that the pit stop was relating the wrong message when it comes to e-mobility and driving range, so this could be an opportunity to introduce new entertainment elements that make Formula E different than all the other racing championships. The shakedown has two practice sessions – an opening 45-minute session followed by a further 30-minute session. Here the teams and drivers take to the track for the first time in earnest – allowing them to get a feel for the track and adapt to the car set-up. My first day at the Rome ePrix concluded with a visit to the ABB Formula E Official Tent where a series of BMW cars have found a home. In display there were the two BMW i8 Safety Cars which have recently gone through a tech refresh, accompanied by the new i3s Medical Car and other i3s models used by racing officials. A series of BMW plug-in hybrids are also part of the BMW i fleet supplied by Munich which assist the FIA officials in different administrative tasks. 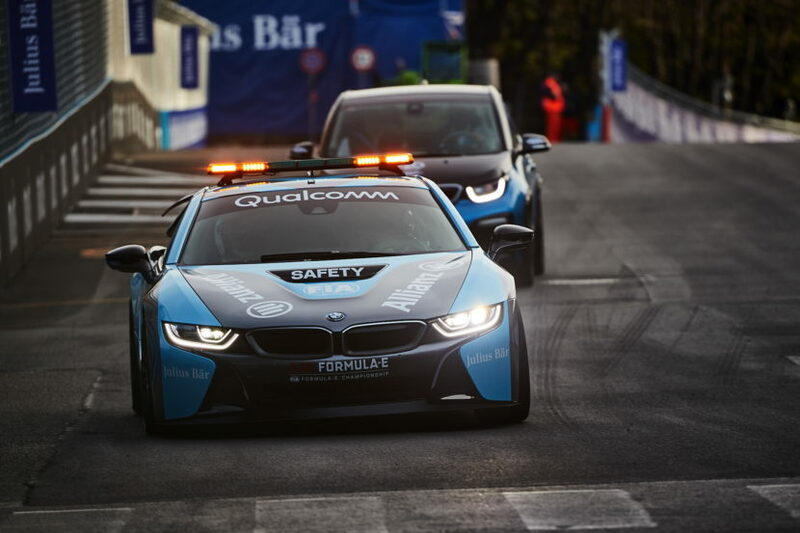 You can read more about the BMW i8 Safety Car here. 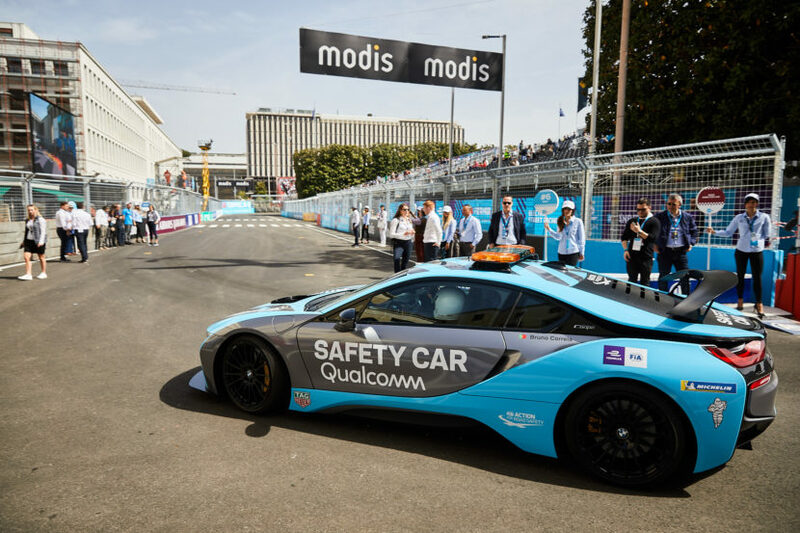 Klaus Fröhlich, Member of the Board of Management of BMW AG, Development and BMW Motorsport Director Jens Marquardt were also present at the event to experience first-hand the electric race in Rome. The BMW Motorsport boss was also gracious to grant me an interview in which he talked about the upcoming iFE.18 BMW Formula E car, the future of the electrified championship and BMW Motorsport activities. A typical Italian dinner with lots of pasta and pizza concludes my day, but not before a pleasant encounter with the Formula E and FIA media communication teams who have once again reiterated that feeling of a close-knit family that surrounds most of the Formula E races. 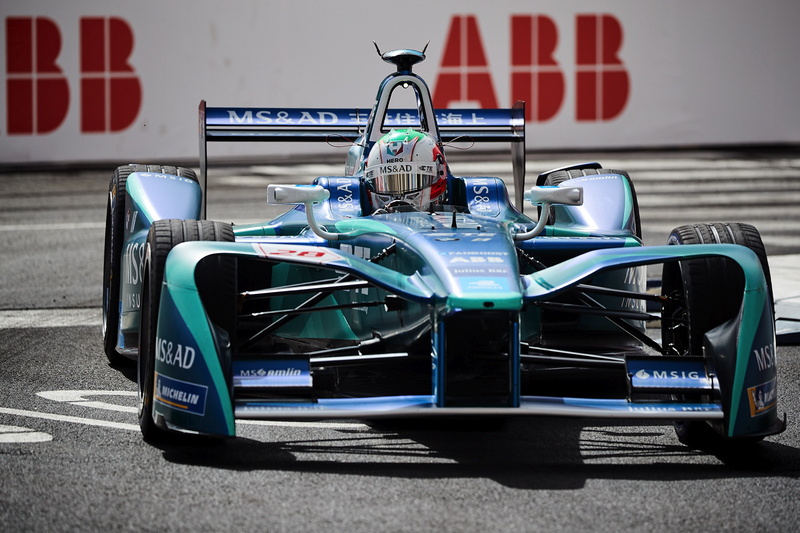 The ePrix and qualifications take place on Saturday. In the morning, the qualifying session lasts one hour and sees drivers divided into groups, decided by a lottery conducted in the driver briefing. Each driver has six minutes to set their best time, with the top-five drivers proceeding to the Super Pole shoot-out in a bid to secure Julius Baer Pole Position and an additional three points. During the Super Pole shoot-out, the drivers go out one-by-one, with the fifth fastest driver from the group stages going out first. In the build-up to the main event, the Formula E drivers join the fans in the Allianz E–Village for autograph signing sessions and the eRace where one driver per team, including one lucky fan, go head-to-head in a simulator race in front of thousands of attendees, with the whole event broadcast live on the FIA YouTube channel. The e-Village is also home to different exhibition displays, including BMW’s own “i display.” This display of electric and plug-in hybrids gives BMW the opportunity to showcase to its fans how the road cars electric technology translates into eRacing and vice-versa. 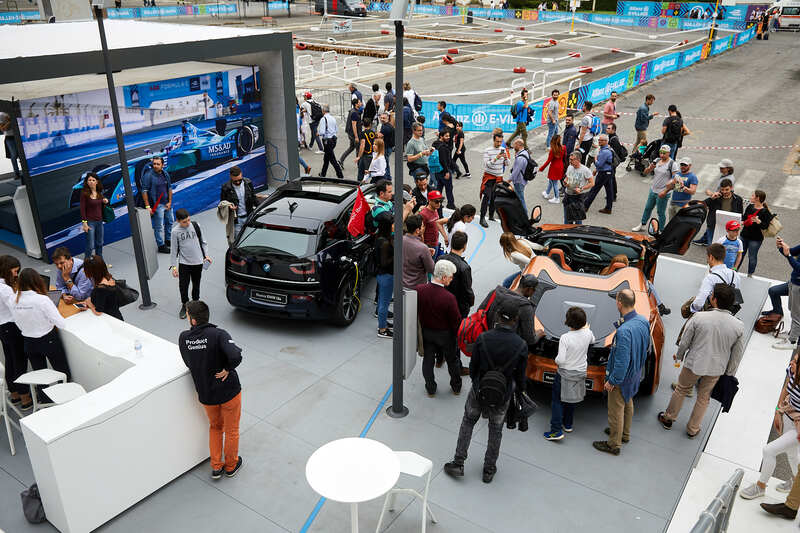 Compared to Berlin two years ago, this is where you can immediately notice the ever increasing popularity of the ePrix, with a large number of people visiting the display or simply walking the large e-Village. The atmosphere is also different than any other racing championship, with numerous families in attendance looking for the entertainment factor provided by Formula E – being gaming simulators or playgrounds, or live bands and DJs who aim to entertain the audience during the event. 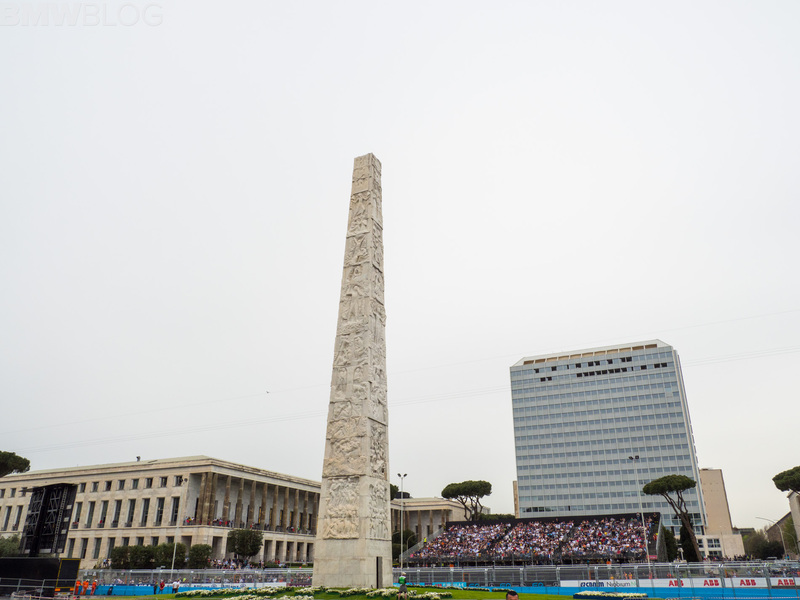 The Rome ePrix also has that “Italian charm”, if you will. “Going with the flow” is the norm here, often adopting the customs or behavior of those around you, and unplanned and spontaneous experiences are part of the charm. It might look like chaos to us Americans, but “When in Rome, do as the Romans do” and you’ll be just fine. Maybe this is part of the Formula E charm where kinks are still being ironed out and lessons are learned at every race, which makes this organized chaos even more fun when in good company and among race cars. Before the race kicks off at 3PM local time, the pitlane is opened to large groups of visitors who, thanks to a special wristband, have the unique opportunity to be inches away from their favorite teams and drivers. 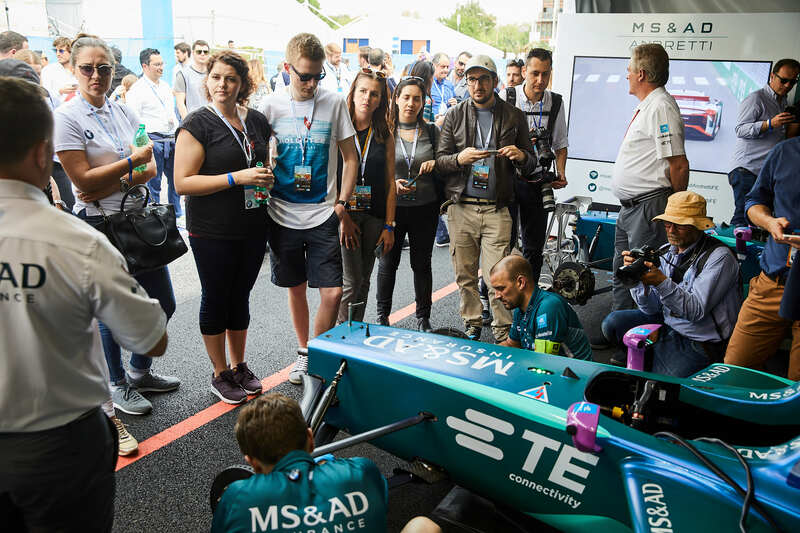 Paddock tours are often offered as well where the crowd can learn about the in and outs of Formula E and electric racing. 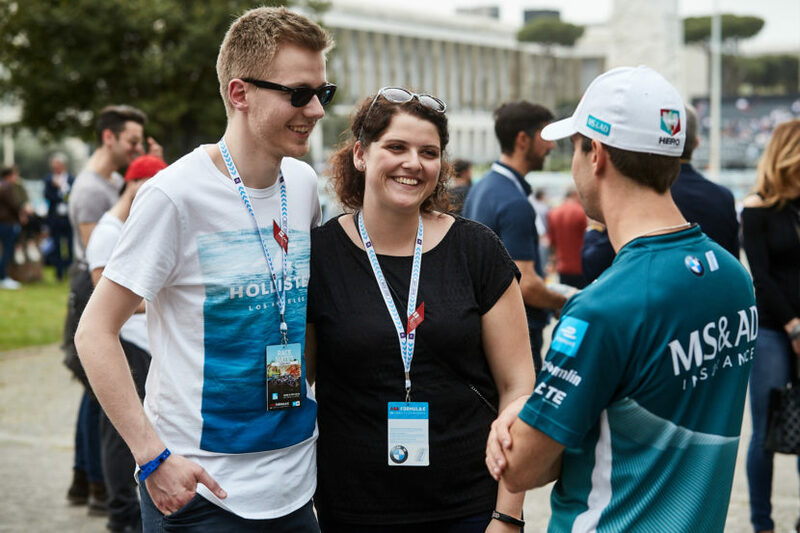 Before the ePrix kicks off, the drivers line-up on a dummy grid, a short distance behind the actual grid and accredited spectators are allowed to join the teams and their drivers on the grid. This presents another opportunity for the fans to be close to the teams, seeing all the e-racing cars from upclose, and of course, participate in endless phootshoots and social media activities. This is where Formula E differentiate itself from the often compared-to Formula 1 where access at a Grand Prix for your average fan is highly limited, and grid access is a dream for most. A recent study shows that the F1 bosses are also looking into street races, to bring the F1 experience into the cities. The Singapore model with a purpose built circuit is often referenced, which allows the teams to get closer to the fans and to bring the sport to them. 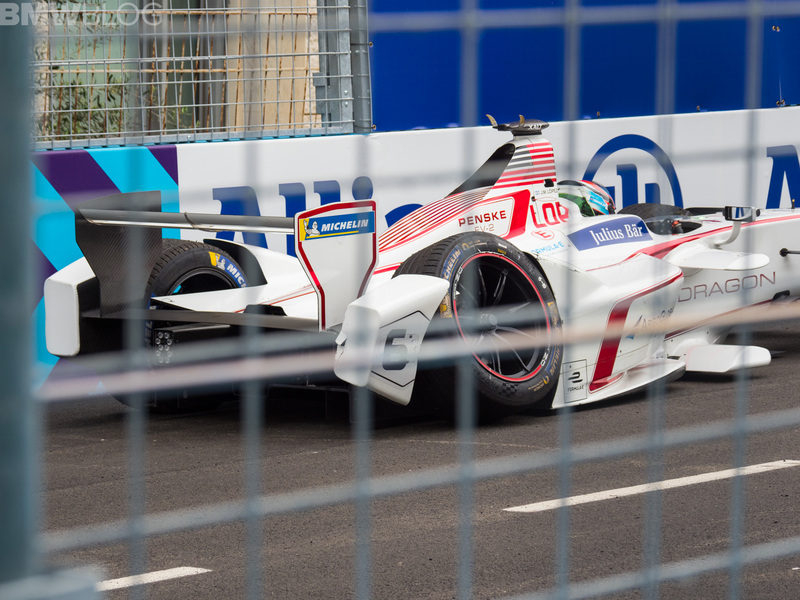 In the ePrix, the Formula E cars are stationary until the lights go green and the race lasts approximately 50-minutes with each driver making one mandatory stop to change cars. In race mode, the maximum power available is limited to 180kW, 10kW more than Season Three. The three drivers who receive the highly-acclaimed FANBOOST – as voted for by the fans – each have an extra 100kJ at their disposal. To stay within the “green” element of racing, for each event, every driver is supplied with a new set of Michelin tires – two front and two rear tires. In addition to the new set, drivers also carry over one front and one rear tire from the previous event. As expected, the undulating Rome topography and the uneven surface added a special element to the race. According to the drivers, the Rome circuit is very technical and challenging, with uphills, downhills, wide corners, narrow corners, and hairpins. All those things made the race quite exciting, with a multi-car pileup involving several drivers and early retirements that changed the final podium during the last laps. 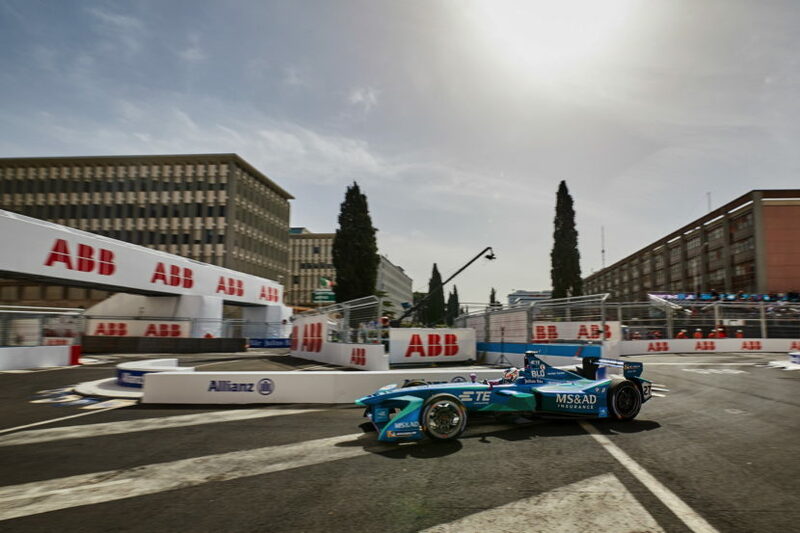 Unfortunately for MS&AD Andretti and its drivers the Rome ePrix hasn’t delivered, Da Costa and Blomqvist finished 11th and 15th, respectively. 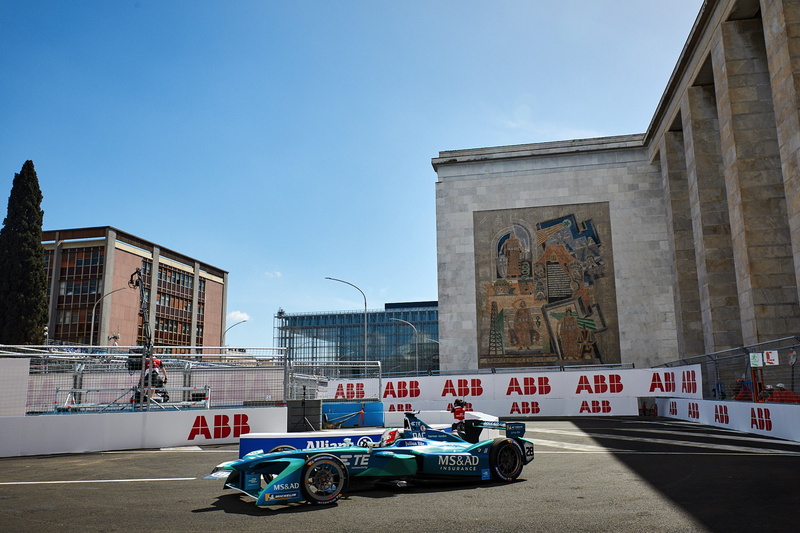 Despite small mishaps and the organizational quirks associated with first time races, the Rome ePrix has been a success for the FIA governing body. 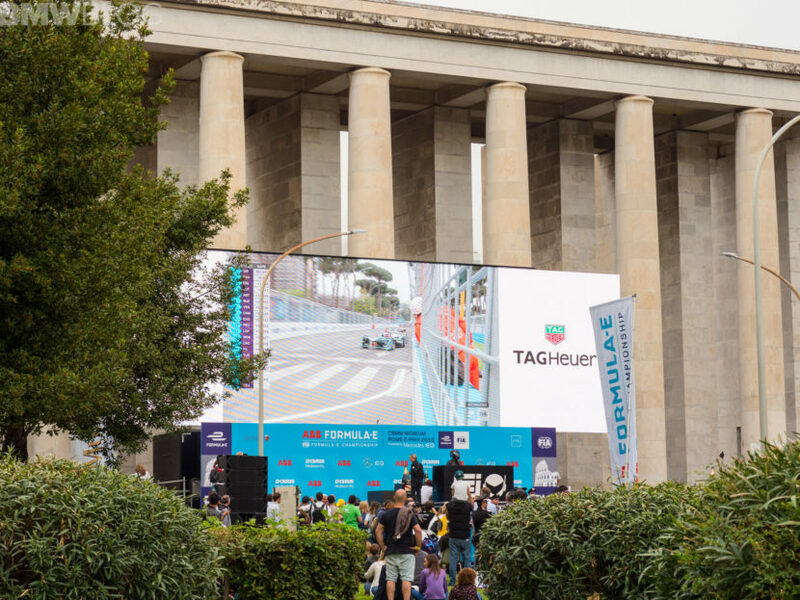 The event has sold out its entire tickets offering and the overall feel is that Formula E has a future in Motorsport racing, mostly due to its futuristic and intriguing electro-mobility, and extended fans’ access to the race, teams and drivers. 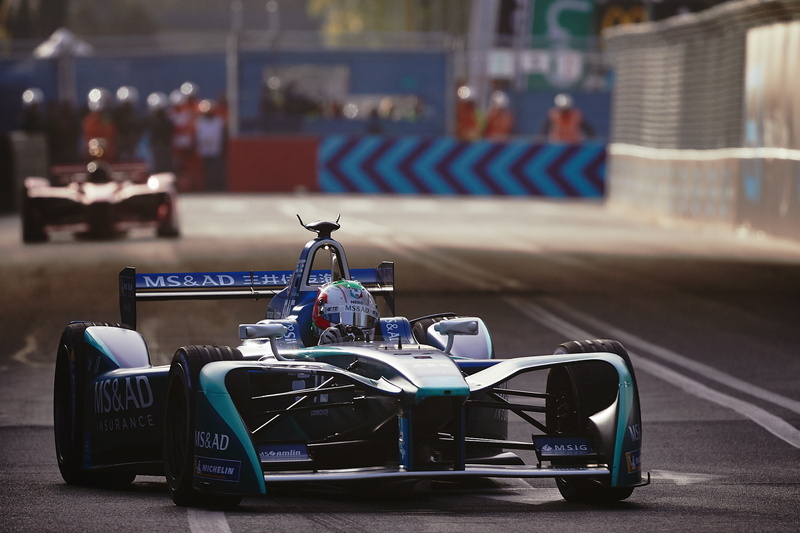 With Season 5 being joined by some of the largest car makers in the world, and more to follow, Formula E becomes the next battleground for the most significant car manufacturers in motorsport. It will also serve as a great marketing tool for their future electric vehicles which are now the present more than the future of automobiles.